A friend of mine used to joke that half of the churches in Rome could be given the same name, “Our Lady of Perpetual Restoration”, which is funny precisely because it is so close to the truth. Every year we have run this series, we have had photos of churches which were partly under restoration, or photos of churches to which a station was transferred, since the regular station was completely unusable; in today’s post, the third of this year’s series, we have one of each. 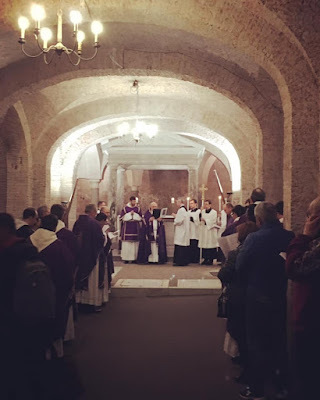 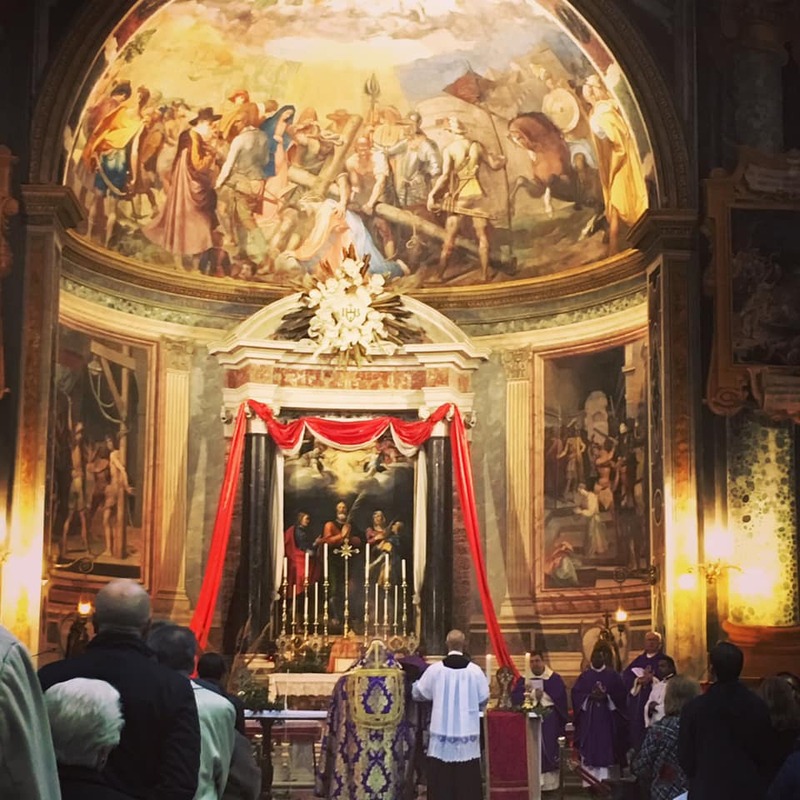 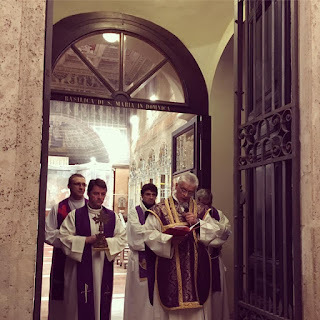 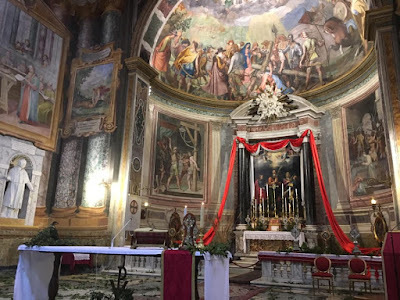 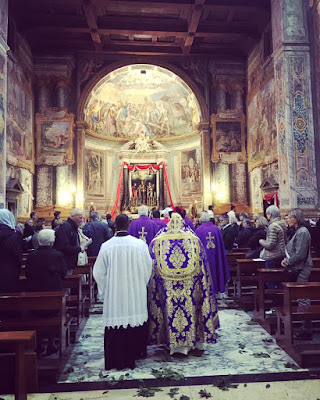 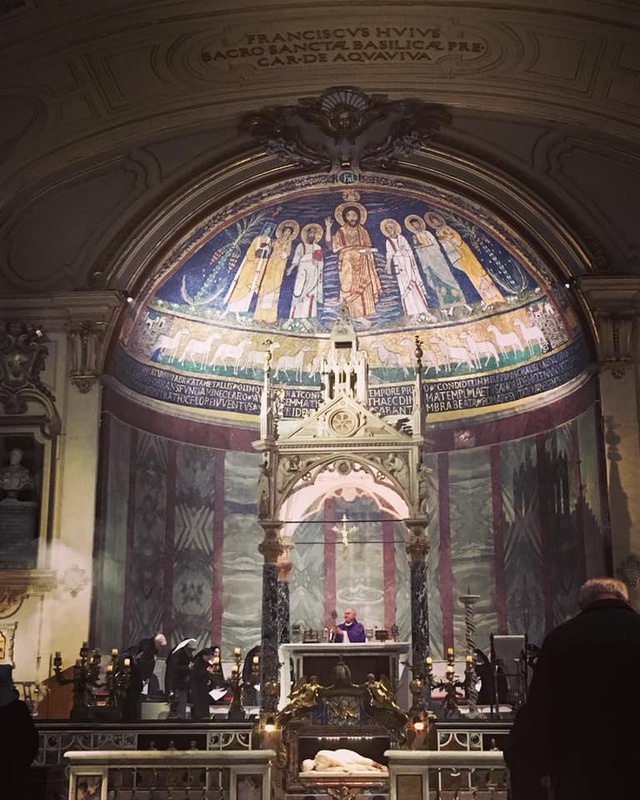 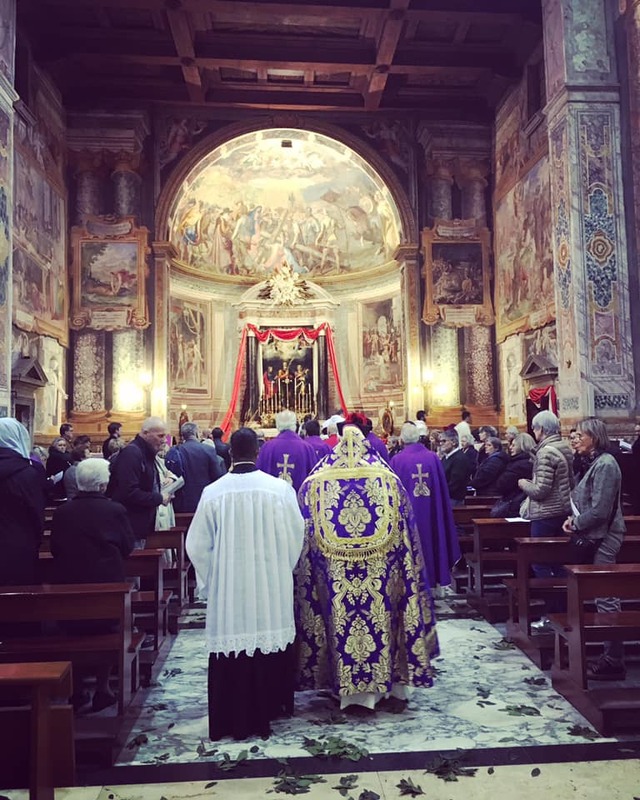 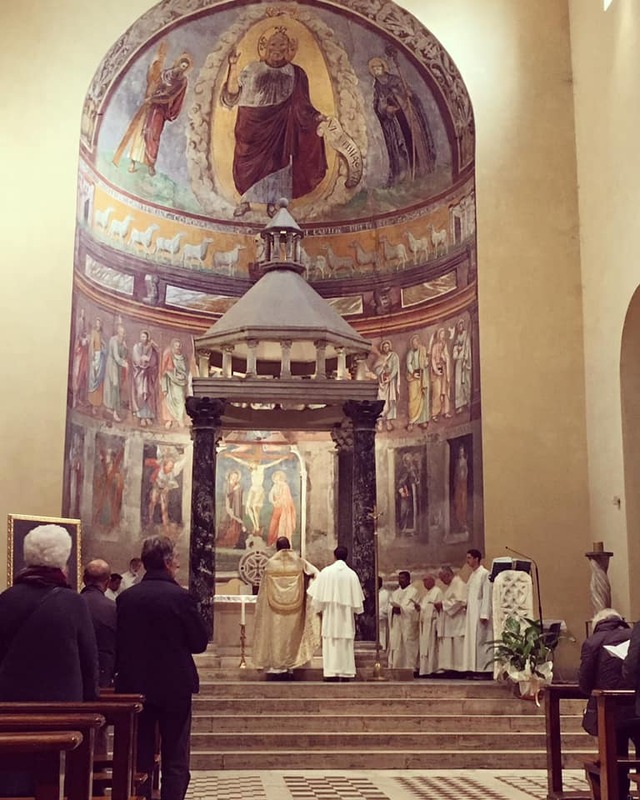 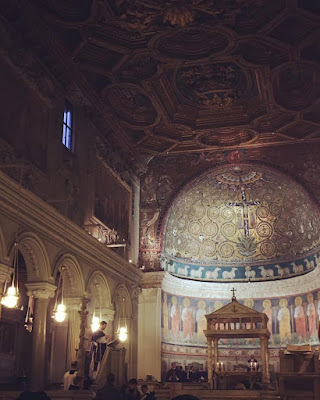 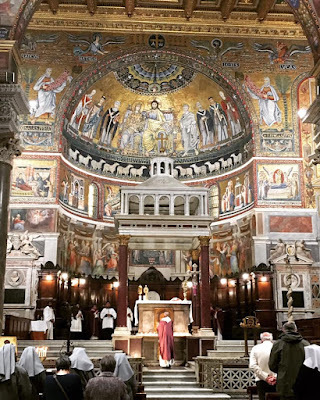 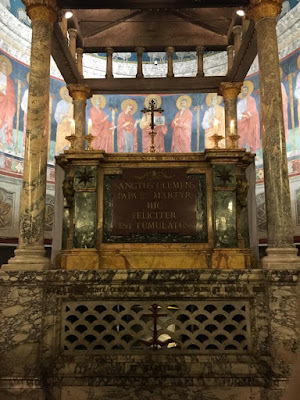 We also have a particularly good set of photos from one of the city’s most interesting churches, the Basilica of St Clement; once again, many thanks to our dear Roman pilgrim friend Agnese for sharing these photos with us. 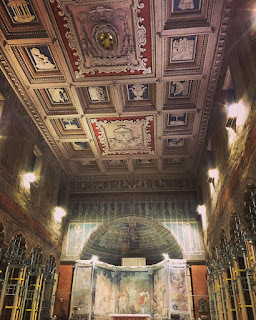 In keeping with a common abuse, which became a particularly acute problem in the 15th century, Giovanni de’ Medici, the younger son of Lorenzo the Magnificent, was made the Cardinal-Deacon of this church in 1489, when he was 13 years old. He would hold the title until 1513, when, after being elected Pope and taking the name Leo X (1513-21), he passed it to his cousin Giulio, the future Clement VII (1523-34). 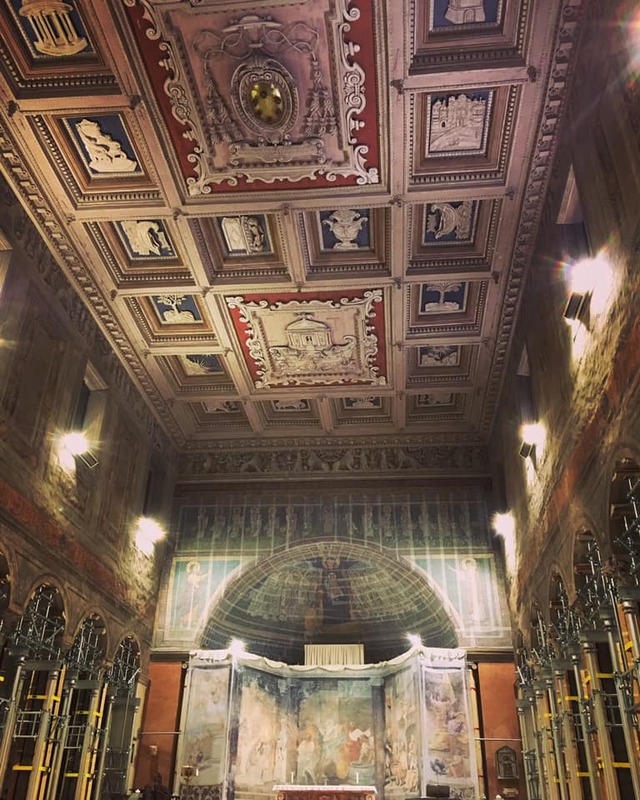 This ceiling was made as part of a major restoration of the church which he commissioned; the various sections represent the titles of the Virgin Mary from the Litany of Loreto, but several are different from the standard text used today. 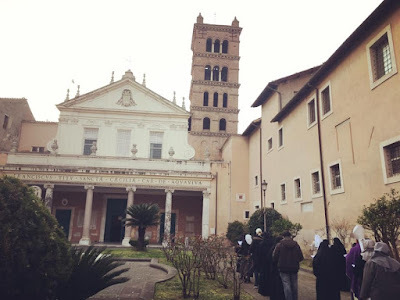 This basilica is famously built on top of two earlier levels; the 12th-century church (seen below in pictures 5-7) sits on top of a church of the 4th century, which in turn sits on top of two ancient Roman buildings, one of the later 1st and another of the mid-2nd century. (All three of these levels are accessible to the public.) 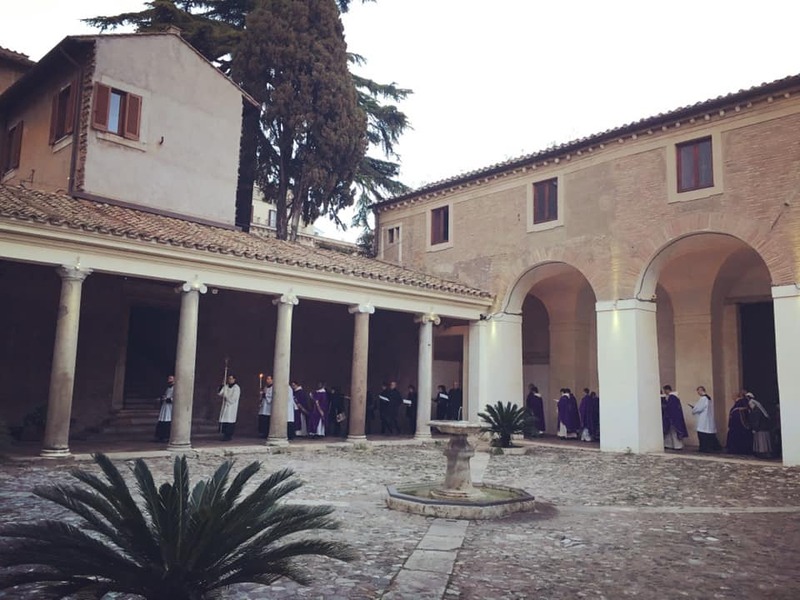 The procession begins in the ruins of the ancient basilica, makes its way upstairs and through the large portico, before entering for the Mass. 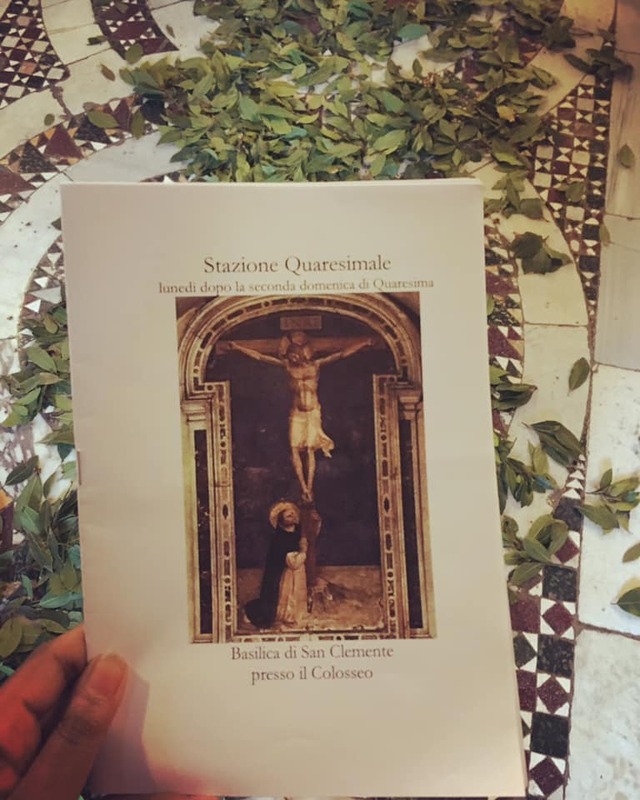 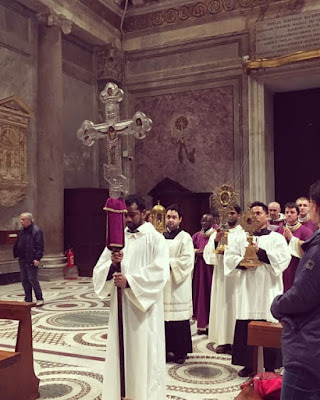 Also notice in the 1st photo the custom of strewing greenery on the floors of churches during the station Masses; nobody seems to really know where this comes from or why it is done. When the second level, the church of the 4th century, was dug out in the mid-19th century, no remains of an altar or any part of the sanctuary were found. 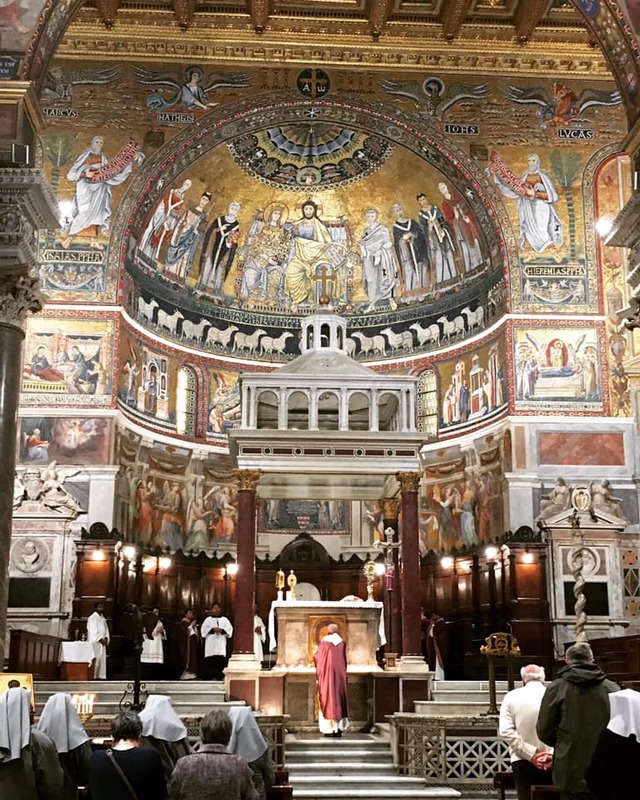 The archeologists soon realized that in the process of building the newer church on top of the older, the 12-century builders had dismantled them entirely, moved them upstairs, and reassembled them in their current place. 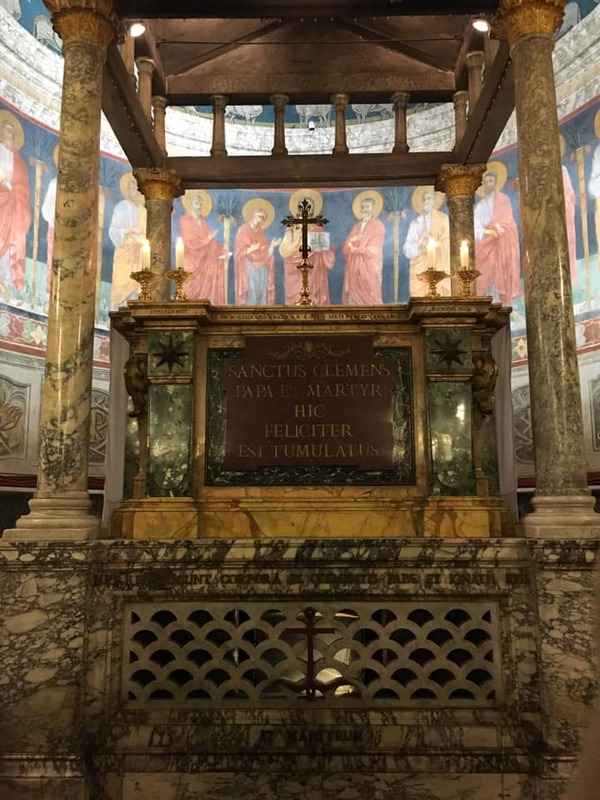 The altar and baldachin seen here were then newly made so that the rediscovered spaces of the older church could be used once again for worship. 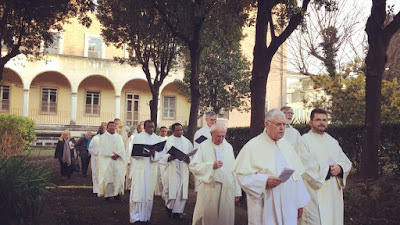 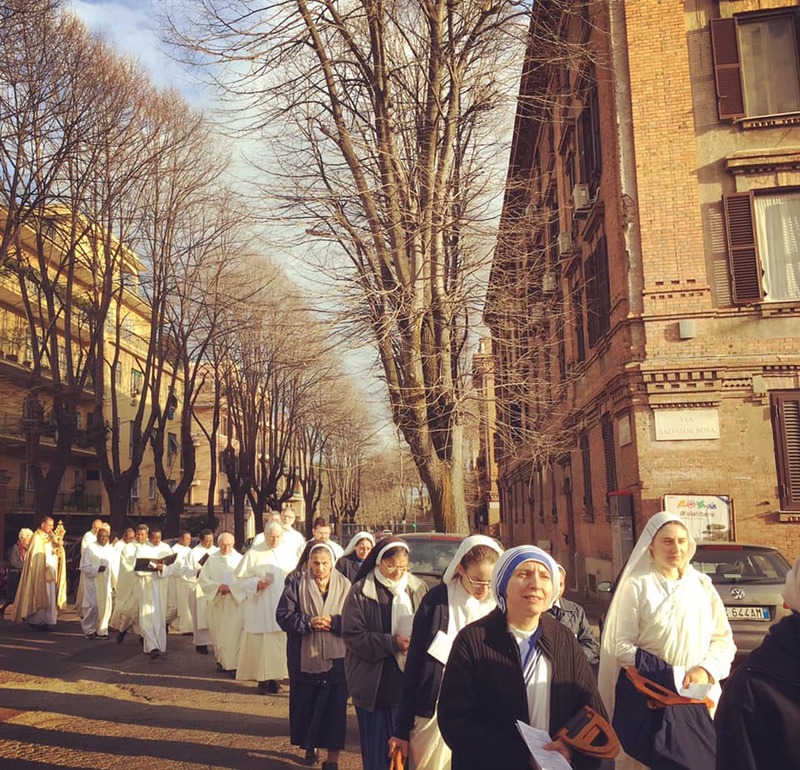 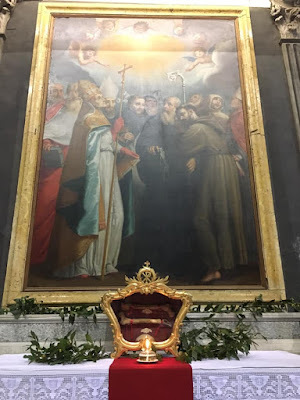 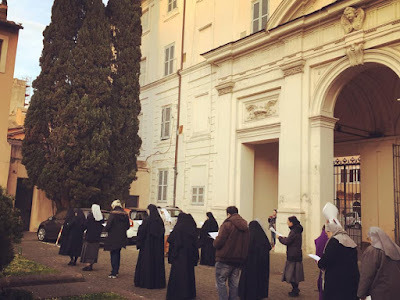 St Clement has been home to the Irish Dominican friars in Rome since the later 17th century; many of their confreres from the other Dominican houses in the city come to join the procession. The church of Santa Balbina on the Aventine Hill is currently closed for restorations, so the station was transferred to the nearby church of St Saba. 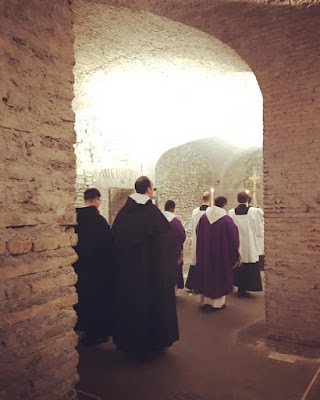 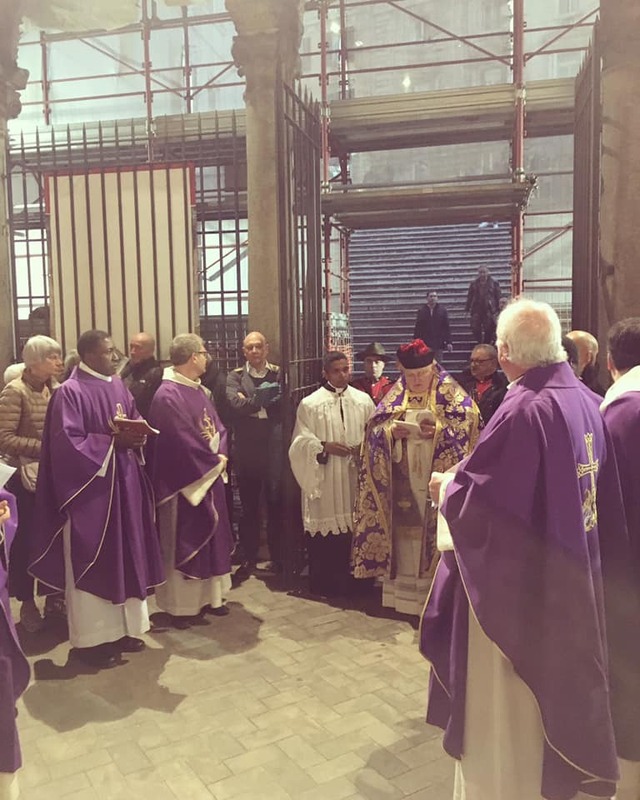 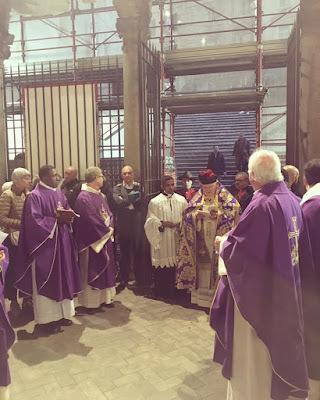 The Premonstratensian Canons’ house in Rome is in the same area, and each year, they sing at the procession and Mass for this station. 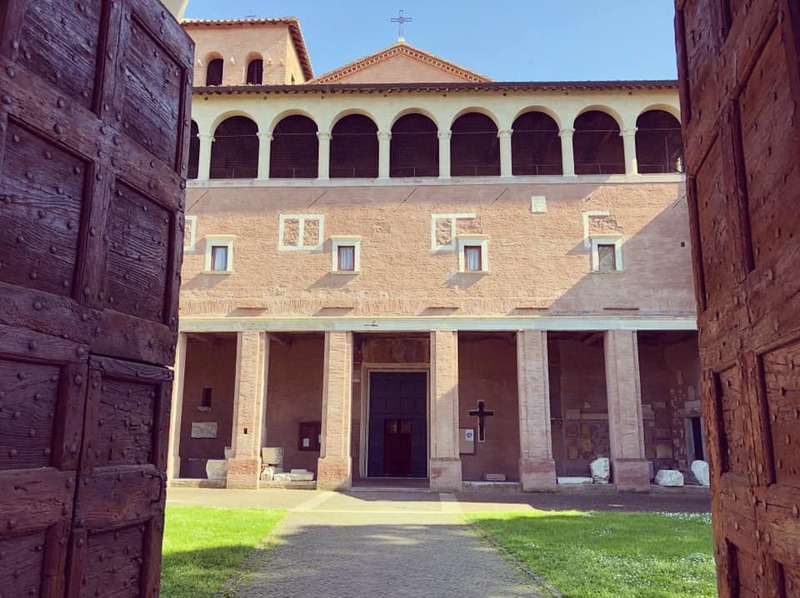 The enclosed courtyard in front of the basilica. 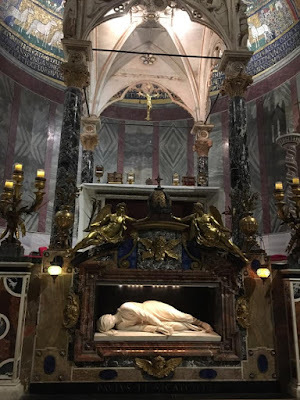 The famous statue of St Cecilia by Stefano Maderno, depicting her as her body was said to have been found when her tomb was opened in 1599. 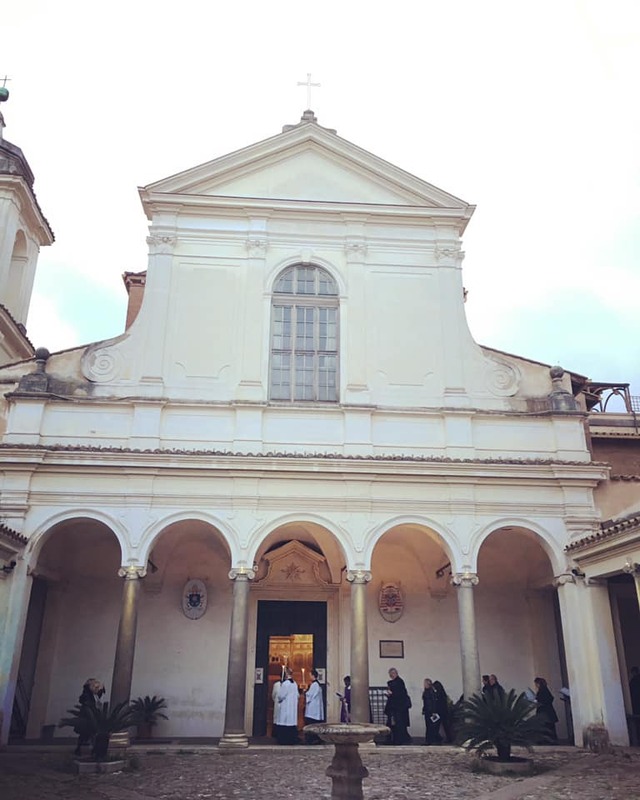 San Vitale was first dedicated in the year 416; modern constructions around it, including the street on which it sits, the via Nazionale, are on a much higher level, and one must now descend a rather large staircase, seen here behind the celebrant of the procession, to reach the church.